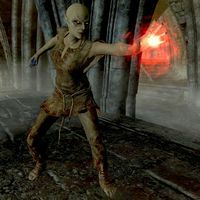 The Feral Vampire is an Altmer vampire encountered when exploring Castle Volkihar with Serana during the quest Chasing Echoes. After entering the secret entrance to the castle, you'll find her with some death hounds before you make it to the courtyard. She is instantly hostile to you whether you have sided with the Dawnguard or the vampires. She wears ragged trousers, footwraps, and a Ring of Minor Destruction, and wields an Elven Dagger of Fear. She also carries a journal fragment which gives a little insight as to why she's down there. This page was last modified on 17 June 2014, at 21:40.